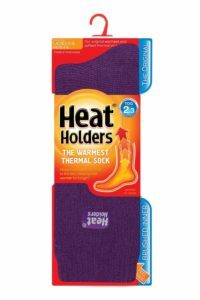 As someone who has suffered from cold feet for years and been recently diagnosed with Raynaud’s disease, Heat Holders thermal socks are a game changer. My cold feet stem from years of wearing tight-fitting race boots in New England’s sub-zero temperatures. Though I’ve been skiing in Tahoe’s milder climate for the last 15 years, my feet are often cold, even on the warmest winter days. I often wear heated socks with bulky battery packs just to watch my son’s hockey games or walk around town in the winter. Heat Holders thermal socks look like they may free me from that android look and save me from charging my sock batteries nightly. 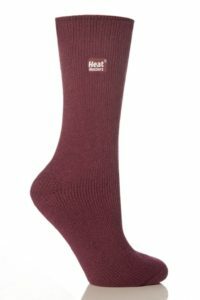 The inside of the Heat Holders sock is an extremely soft fleece material, with enough loft to truly insulate my feet. The “Gentle Grip Top” don’t fit too tightly on any part of my foot, ankle or calf. Though a snug fit is desirable for performance ski boots, it can reduce circulation so that no amount of insulation helps. The non-restrictive fit of Heat Holders thermal socks allows for unrestricted circulation, further warming my fragile feet.